theswca blog: Kenner Kids Vol. IV: "BREAKER, BREAKER, Blast Those TIE Figthers, Luke!" "BREAKER, BREAKER, Blast Those TIE Figthers, Luke!" Perhaps the most logical of Kenner's recycled toys hastily produced during the initial Star Wars craze, the Luke Skywalker AM Headset Radio represents a vintage rarity that surely must have pulled the wool over some eyes as a genuine product from a galaxy far, far away. As described in the 1978 Kenner Retailer Catalog, this headset was equipped with a "pretend microphone styled like the one worn by LUKE SKYWALKER in STAR WARS." Sounds about right, doesn't it? Dad ponders, "It surely must function better and last longer than those flimsy inflatable laser swords...hell, those came with repair kits." In terms of special features, it "actually receives local AM stations... has a station selector... volume control...comfortable padding for ear... It's adjustable to fit all head sizes." What is more, "Special STAR WARS labels add exciting fun to pretend STAR WARS adventures." Those labels sure did seem to add a lot of "fun" to everything at that point in time. Regardless... before they knew it, Timmy and Jimmy could be spending hours taking out TIE Figthers from windows of the backyard treehouse while catching some Boss Radio on the airwaves. The packaging established a relatively clear resemblance to a memorable scene from the film and seems perfectly appropriate. 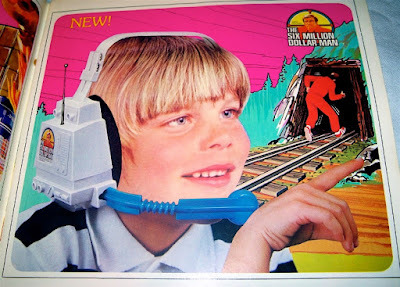 But alas, this toy had a former life being adorned by much goofier looking kids as Kenner's Six Million Dollar Man CB Headset Radio Receiver that was on shelves only a year prior. 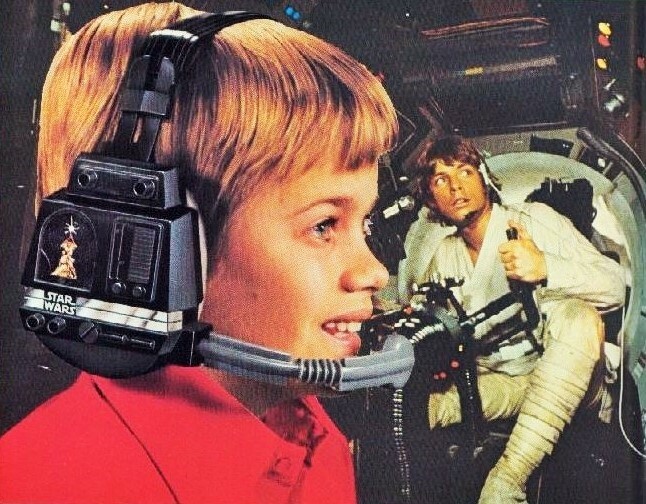 Who knows what this child is actually pointing at or thinking about, but he surely isn't ready to man a turret in the Millennium Falcon, as is illustrated by the much more engaged and focused youth chosen for the Star Wars version. For those interested in the history of toys repurposed for and by Star Wars, be sure to check out Ron's comprehensive SWCA Special Feature "The Recycling of the Force."